It is yet again time for a Do It Yourself (DIY) because I of course do not share enough of these normally ;). So as the name indicates today I have got a DIY Conditioning Cream recipe and surprise surprise the mix contains…….coconut cream!!! Jokes aside, apart from the Coconut Cream it also contains Flax Seeds, Fenugreek Seeds and two different types of infused carrier oils (coffee bean infused almond oil and coffee bean infused coconut oil) along with some Essential Oil at the end. Another additional ingredient is a moisturizing conditioner with can be added to the mix otherwise should be used after rinsing the mix from your hair (more details about this below). For now, let’s break down the ingredients and their benefits. Helps with hair growth due to the rich source of vitamin E.
Due to the Vitamin E oil it is said to help slow down premature grey hairs. Contains Omega-3 fatty acids which helps provide the hair with strength and elasticity. Helps fight hair loss (excessive shedding). Can help ease scalp irritations such as dryness and dandruff. Nourishes the hair roots, shaft, and the scalp. (Tip: Fenugreek is a popular ingredient in Asian dishes (mainly India) so in case you can’t find the seeds in your local supermarket/grocery store – (the “ethnic” isle) check your local Indian markets you will be able to find them there). *NOTE: Due to the presence of protein in coconut cream some of you might find that it makes your hair feel hard. It is recommended that if you do not use a moisturizing conditioner as part of the mix that you rinse your hair with a moisturizing conditioner after you rinse your hair. 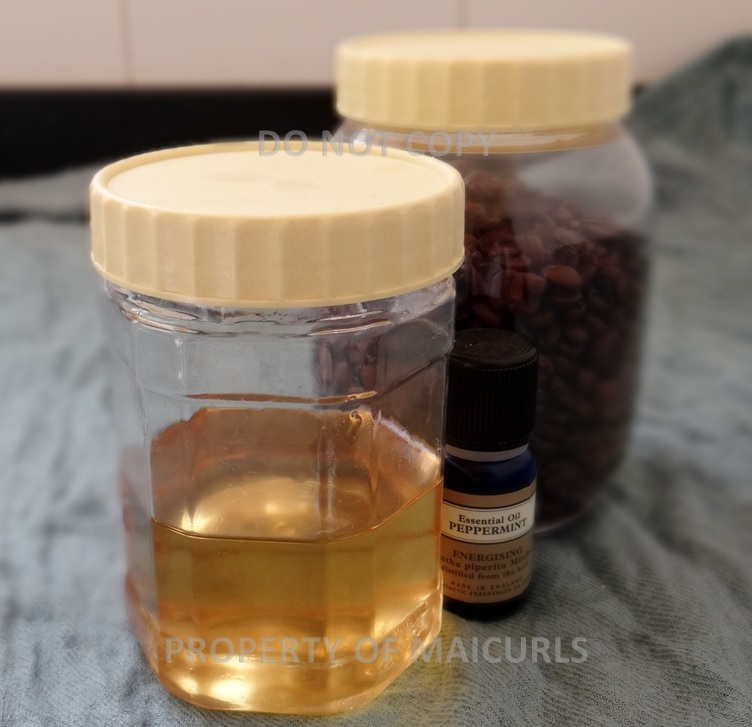 I use coffee based oils since it has a whole number of benefits e.g stimulates blood flow therefore growth in the hair, helps keep the scalp clean, provides luster to the hair, provides shine, helps to subtly darken the hair and so much more. 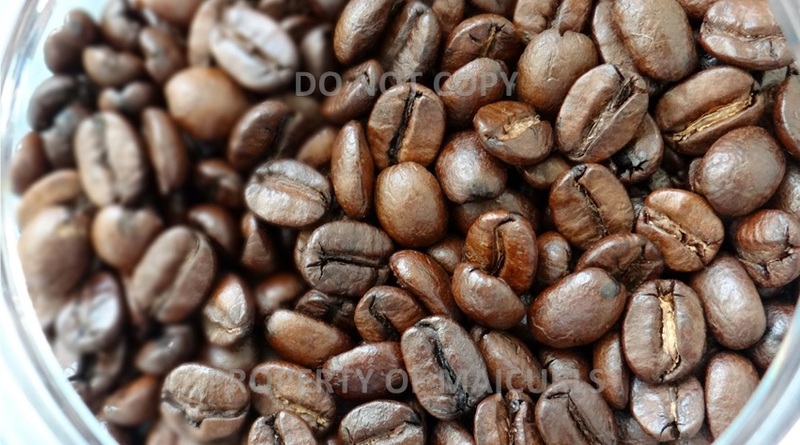 I have a lot of details about coffee infused oil here but you can use any oil of choice. Before I begin the recipe I first soak the seeds in 8oz of plain water overnight (you can choose to soak them for less time or skip this all together). Boil the seeds in 7oz of plain water on low heat just until it starts a rolling boil (string the whole time). Pour the liquid through a strainer and reserve the seeds (they can be stored and reused later if kept in the freezer). Rinse out the pot and warm up the coconut cream just till it starts to thicken (no more than 3 – 5 minutes). Add the warm coconut cream to the liquid and stir thoroughly. (If you choose to add conditioner to the mix directly, do so now) then add the oils, stir and pour into the container. Once the mix cools you can add Essential oil (optional). Instead of adding the conditioner to the mix I like to use it after I have rinsed my hair and the water runs clear. I do this because I am not the biggest fan of the scent of Fenugreek seeds. Some have said that they get a “maple syrup” scent when they use Fenugreek seeds, I get no such smell! To me the seeds have a spice scent that I am not a fan of but that is way I add essential oil (usually peppermint) once the mix cools and then do a final rinse with conditioner.If you use conditioner in the recipe this will give your mix additional slip and that will help detangle the hair even further. Apply the mix to freshly washed, clean and detangled hair going from the ends to your roots. Use your fingers to gently “finger comb” and distribute the mix, cover with a shower cap and let it sit for 10 – 15 minutes and rinse your hair using warm water. If you feel like you need to follow up with a moisturizing conditioner do so after the water runs clear. You should be left with hair the feels stronger but not dry, shiny but not sticky, basically your hair should be feeling happy! NOTE: If you have any leftover conditioning cream you can store it in your freezer for future use (I always have some left over). You also can freeze your coconut cream in case you don’t use the rest for cooking – it is delicious in curries btw ;). I would love to hear if you have ever used Fenugreek seeds before. If you have, please let me know if you get that “maple syrup” scent from your seeds. This entry was posted in Almond Oil for hair, Coconut Cream, Conditioning Cream, DIY Coconut Conditioning Cream, Fenugreek Seeds, Flax Seed, Methi Seeds and tagged Coconut, Coconut Cream, Coconut Cream for natural hair, DIY Coconut Conditioning Cream, DIY Conditioning Cream, DIY hair care, fenugreek, Fenugreek gel, fenugreek gel for natural hair, Fenugreek Seeds, Fenugreek Sees, Flaxseed for natural hair, Flaxseed Gel, Flaxseed gel for natural hair, Flaxseeds, FSG, How to make conditioning Cream for natural hair, Methi Seeds, natural hair, natural hair care on February 3, 2016 by Maicurls.